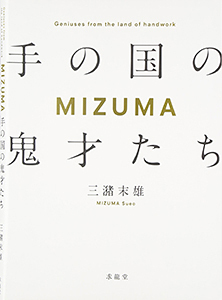 A talk event will be held at Aoyama Book Center (Tokyo) on Thursday 11th February 2016 in celebration of the publication of MIZUMA Sueo’s book ‘MIZUMA: Geniuses from the Land of the Hands’ (Kyuryudo Art Publishing, December 2015). Mizuma Art Gallery Director Mizuma Sueo will be in dialogue with art historian, critic and Professor at Meiji-Gakuin University Yamashita Yuji. This event will be a special addition to Mizuma Sueo’s talk series ‘日本再再再発見’ (‘Japan Re-Re-Re-Discovery’). To reserve your place, please register with the Aoyama Book Center by email, phone or online via the link below.